This fabulous bride and groom took some time before their wedding ceremony for some portraits of just the two of them around the Roosevelt Hotel in New Orleans. We captured some wonderfully natural and candid shots, as well as some more posed portraits, around the vicinity of the hotel and in the Pere Marquette, but this photograph, under the beautiful Baronne Street entrance of the Roosevelt, was my favorite (and actually ended up being picked as the cover for the couple's Coffee Table Book album). I love all the intricately detailed carvings and other flourishes that adorn this entry, though being fairly high, it can be a bit tricky to compose a shot that incorporates it (this usually involves me laying down in the street along the curb). But it's worth the effort! The hotel's Blue Room is a famed and historic music venue that is frequently used for wedding receptions, and there are several other ballrooms that can host events of just about any size. 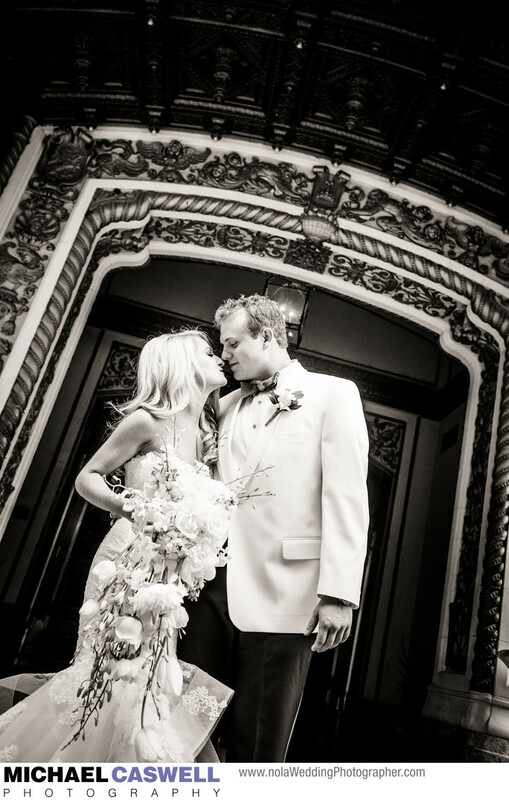 Also, it is conveniently located right across the street from Immaculate Conception Catholic Church (the Jesuit Church), so this combination of church and hotel is a natural choice for a classic New Orleans wedding, though the hotel itself can also host your ceremony. The hotel originally dates back to the late 1800s, though a larger addition was built about 15 years later, which still stands. The original half of the hotel was torn down by a subsequent owner in the early 1900s and rebuilt to the same size as the addition. The hotel has gone through a few name changes as ownership changed hands over the decades. Originally the Hotel Grunewald, it later became The Roosevelt, then The Fairmont, which it remained until damage from Hurricane Katrina forced the hotel to close. But a few years later, new ownership made a massive investment to completely renovate the historic hotel, both modernizing it, and restoring it with a beautiful art deco look that harkens back to it heyday, along with changing the name back to The Roosevelt and designating the Waldolf Astoria to run the hotel. You'd be hard pressed to find a more beautiful hotel lobby in all of the Crescent City, and it is famous for the stunning Christmas decorations the hotel puts up each holiday season.